I remember it was night of 29th July 2007. We came home in late evening after some shopping and cooked dinner. We almost finished eating when we got call from my friend’s cousin asking whether we would be interested in visiting ‘Trishund Ganapati Mandir’. We were bit tired but info which he gave sounded very interesting and we rushed to the temple. It was Guru Poornima day and the underground (cave) of this temple is only opened to public on this day till 12 in the midnight. We reached and joined the queue for ‘darshan’. It was an amazing temple carved in black stone. I never imagined any antique temple like this in any of this peth areas. After the temple entrance, on right hand there are stone stairs to go to underground cave. There was knee-deep water due to fresh water springs below. The water was pumped out by the water pump so that devotees could walk properly. There is small Ganapati idol in the stone wall. Also there is a Samadhi of Bhimjigiri Gosavi who has built the temple. We took darshan and came up. It was such a divine atmosphere in the temple that night that I cannot forget. We thanked my friend’s cousin for calling us promptly and without him, we would have never known this temple and about the cave beneath it which is opened only once in a year. We came back late night from the temple. I kept on thinking about our visit in such haste to this place that night. Some things are bound to happen. We couldn’t click any snaps that night and that urge remained in my mind for quite long. Finally two days ago I made plan to visit ‘Trishund Ganapati Mandir’. Today morning I got up early and got ready. One of my colleagues too joined me and we went to the temple. We were lucky to get morning pooja and arati. In the crowded mess of narrow lanes and much hidden in today’s concrete jungle of Somwar peth, this elegant and beautiful black stone temple of ‘Trishund Ganapati’ comes as a pleasant surprise. This temple built in 1754 to 1770, is a masterpiece of stone masonry carvings. There are two sculptured ‘dwarpals’ (doorkeepers) at the entrance along with other elaborated carved peacock, parrots, elephants in combat, chained rhinos with soldiers and mythological figures from ancient era. After a spacious sabhamandap comes the sanctum where the idol of the unusual three-trunked Ganapati, sitting on a peacock (Mayur) is installed. Hence the name ‘Trishund Ganapati’ or ‘Trishund Maruyeshwar’. Riddhi-Siddhi stands on sides of the idol. The historical information says that this temple was built as Samadhi temple and a practicing school for mystics – Hathayogis and disciples of Mantrashakti! The temple is built in two levels – the upper level is opened to public throughout the year and underground only on the day of Guru Poornima. Exceptionally beautiful Trishund Ganapati temple is an archeological heritage which needs to be preserved as pride of ancient India. A must visit place for people who love to see some thing unique and antique along with religious facet. 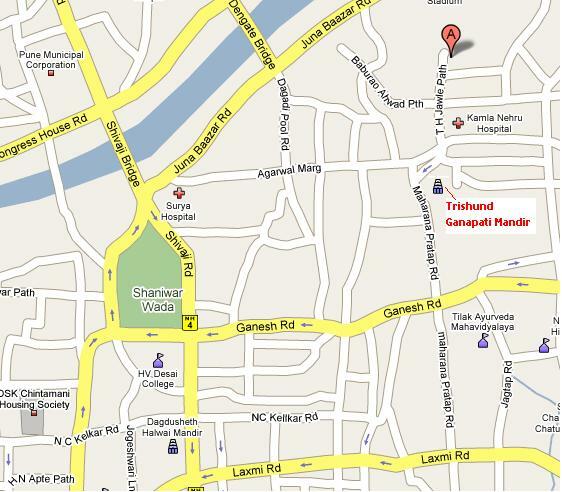 NOTE: Here is the Google map image to get directions to go to ‘Trishund Ganapati Temple‘. Hey Guys tomorrow is Gurupornima. Lets take the darshan of Trishund Ganapati. Nice short trip! It’s great to learn about hidden places in Pune. One suggestion, why don’t you review good eating places too? I can suggest a few, like Gayatri Dabeli near Patrya Maruti, Durgasingh Lassi, SPDP on Balgandharva bridge, Bedekar Misal etc.